We are in the process of getting our house in order. Reading Tsh Oxenreider's Organized Simplicity was a swift kick in the behind! It is time to declutter, clean out and simplify. While talking about the project ahead of us, David mentioned wanting to park cars in the garage. Imagine that, cars... in the garage. The IKEA shelves must go. Okay. The air hockey table must go. Gotcha. The foosball table must go. My throat suddenly constricted, eyes began to tear up. I was surprised to find myself crying. 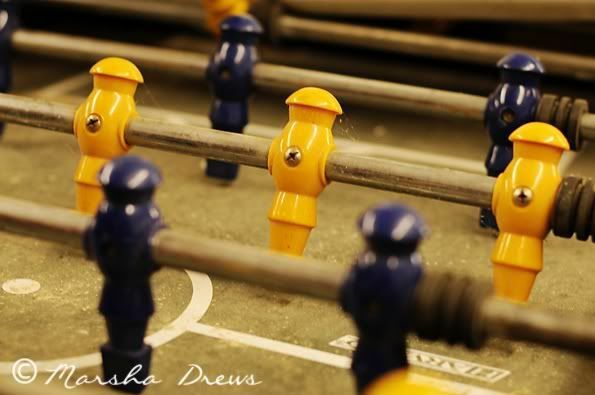 I have walked by that foosball table a million times and never gave it a second thought other than noticing that it is in the way and collecting dust. As soon as David said it must go, the memory of Christian at 2 years old popped into my mind. Austin and Noah would often play foosball in the garage. They loved teaming up against daddy! Never one to be left out, Christian would climb onto an overturned plastic bin to get in on the action. I was always nervous that he would get jabbed in the chest with one of those handles. By the time he was 3, he was quite the little player on his own, laughing as the ball would race back and forth across the table. This must be how Noah had felt about the bulldozer. I do know that this is just a house. And that the foosball table is just a thing. They are not my Christian! I don't ever want to get so attached to things that they dictate how I live, where I live or how we enjoy our space. It would be a shame to waste grief on stuff that has no eternal value. I can't take those things with me, nor would I want to. Heaven is way better than anything we can possibly possess here on earth! 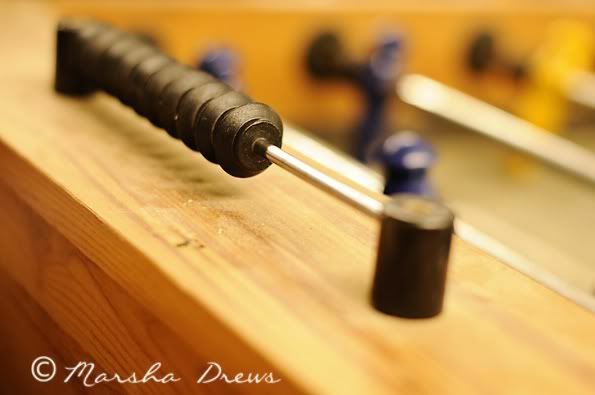 If the foosball table were to disappear tomorrow, I would not be heartbroken. Sure I'd miss the memory jogger that it is, but the table itself is not the root of the missing. The root is Christian. Not a day goes by that my mommy heart does not long for the feel of him in my arms and the sound of his voice in my ears. It makes me praise God even more for the hope that we have through Jesus Christ! I know that this is not the end. There is more... much more... in due time. Do you have things you are holding onto? Do those things have a hold on you? Wonderful post. You will clean, you will organize, you will purge and you will remember your dear Christian. Hugs to you during this endeavor. I don't think it will be easy, but it will be somewhat liberating. Love to you and your fam. Hugs Marsha! I am a purger, but have been extra purging along with the book as well. I am writing a post right now about our closet, and saw you tweet. You'll have to come see, it will be up in a few. Good Luck! Back to work! Still praying for you, Marsha, as you experience new stages of this "journey through grief". I'm so glad we have the eternal hope of Jesus Christ to cling to! Wonderful post. I love you so much!!! My sister and eemo heart just got all in knots reading this. Oh Marsha. I couldn't even imagine. Praise God that you know the One who owns this world and all that is in it. Praise God that you'll spend eternity with your dear Christian when your time here is over. Praying for you. I am glad you are keeping it. I have so many things in the garage I must get rid of...sometimes I don't know what my hold up is! The thing that used to have a hold on me, and I think we've talked about this, is the upkeep of the cemetary where Joslyn is buried and my duty to visit/take flowers. We used to take new flowers every month and we would visit once a week. She is buried in the very rear of the cemetary in what they call Babyland. With it being in the back it is very often neglected and the grass isn't cut, the leaves aren't removed, for weeks and weeks. I would get so worked up, and angry, that they weren't doing any better of a job taking care of my child's final resting place. I felt as if it were a reflection of my care for her. I still have a hard time with it. No amount of complaining I've done has made a difference. We don't go as much and if it is for something important like her birthday or a holiday I call ahead and ask them to go back and clean it up. It was really wearing me down even though I know it is not even her in that tiny casket. I had to choose whether I was going to let that take my joy or let it go. My heart goes out to you. I have been trying to work out who is reading my blog from Guam. I found your comment on Roscommon Acres, and have only today caught up with her sad story. I wonder if you have any news of Guam? They say the tsunami hit there. Hopefully the damage was minor, as in Hawaii? ?